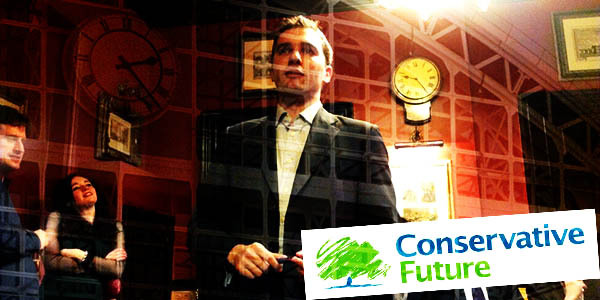 TheBlueGuerilla: EXCLUSIVE: Tory Youth National Chairman 'Blocked' at CF Reception. EXCLUSIVE: Tory Youth National Chairman 'Blocked' at CF Reception. As an early CF election campaign takes hold and rifts publicly emerge, tbg can sensationally reveal that Conservative Future (CF) National Chairman Oliver Cooper was allegedly blocked at this year CF reception, with the two national executive deputies taking control. One anonymous source told tbg - "Sarah-Jane Sewell and Robert Manning took full control of the CF reception here at conference and blocked Cooper by not letting in the people they didn't know or like. Instead they brought their own friends without tickets." Influential CF'er Dominic McDonough told tbg - "I couldn't get in. CF young professionals reception was a success though thanks to Ollie and Liam Fox." Both events were crap, with the same awful rah rah CFers at both, a bunch of students pretending to be "young professionals." I dobt like Coopef, but he was in fact going round speaking to each group at the event and introducing Chris Grayling to everyone. The fact that he was awful at it and no one wants to talk to him is a different issue! Grayling wasn't introduced to the group I was with! Cooper had to talk at an event on the other side of town and got back as soon as he could. Besides SJ and Manning are on the exec so they should be helping out, hardly saving the event when they are just doing what they were elected to do. Lets be honest. The only thing that mattered is how pretty miss jasmine looked throughout conference! Who the hell is Jasmine? All we do is hear about her. Is she allowed out? Wtf is wrong with @2.29pm? Jasmine is our ToryDarling!